Need to repair or upgrade your pool equipment? No problem. Century Pools can help you update your system to the newer and more efficient equipment. We have all of the chemicals and supplies you will need for your new or existing pool. 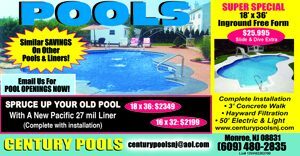 For more information about our Pool Supplies, please contact Century Pools at 609-259-6169 or fill out our Contact Form on the left side of the page. You can also visit us at our new Showroom Location, click here for directions.